Our yearly drawing challenge is upon us! You can see the results of the previous years in the links above (just under the main banner). All Art that gets sent in will feature here on the blog and in our Facebook group, labelled with the Artist’s name and contact details as appropriate/possible. Tag it on Instagram with #31SSC18 (31 Day Drawing Challenge 2018). I (or one of the other admins) will create a folder titled for each day on the group page. Please pop your photos in the correct folder. (non members just join our group). 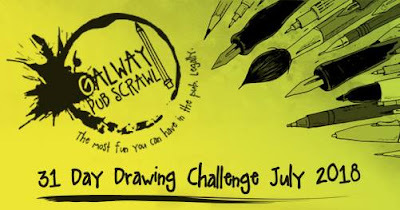 Alternatively email galwaypubscrawl@gmail.com and I will (eventually) assemble all of them here on the blog. All skill levels are accepted, it’s just important to have fun with it! Everyday of the month, check the topic and make some kind of Artwork inspired by that.